They say practically every animal is designed to kill things — including humans — in Australasia. A recent viral Instagram post proves this theory. In a video captured off the coast of New Zealand, a kayaker was slapped in the face by a hungry seal attempting to kill a desperate octopus. “Yes I got slapped in the face with an octopus by the seal! I know crazy right,” wrote Kyle Mulinder on his Instagram post. “After a fun paddle around the peninsula catching waves we spotted a giant male seal fighting an octopus. Before we knew it the fight came to us and well the rest is slap to the face,” he continued, explaining his slimy brush with the tentacled creature. The octopus, shaken from its near brush with death, clung to the bottom of Mulinder’s kayak, seemingly in love with its inadvertent saviour. 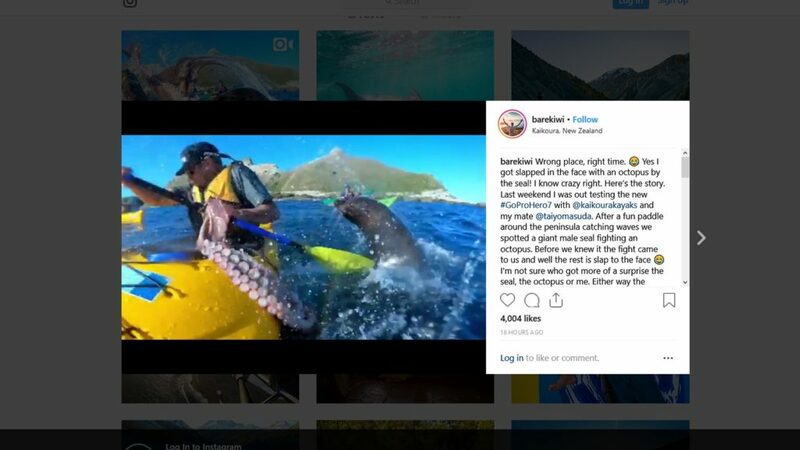 “Either way the octopus held onto the bottom of kayak for some time before our guide was able to get it off with his paddle then it swam away to fight another day,” Mulinder concludes. The clip, which also includes a lot of cringy “wooooooooing”, has since received over 4000 likes and 19 000 views on the social network.